Find by date, by the foreman, and/or by a project. The idea was conceived by Runjob’s founder based upon his asset losses from theft combined with not knowing where assets were from day to day. The need was to track assets with certainty and in a cost-effective manner. Many companies offer a means of GPS-tracking, but far fewer utilize a system of on-demand tracking. Simply attach a label and utilize powerful technology to maintain control of company assets. Runasset is a simple, affordable, and powerful means of knowing the condition, location, and current user of assets in your company! Order a starter kit today. Problem: Small tools from jackhammers, pipe lasers, total stations, concrete/soil testing equipment, and laptops to large equipment such as automobiles or dozers get lost or stolen. Solution: Adhere a QR or NFC label to the asset and track them on-demand using our mobile app and web application. Problem: Parts regularly arrive in your warehouse or at the front desk, but communicating this to your field personnel for project incorporation can be sloppy. 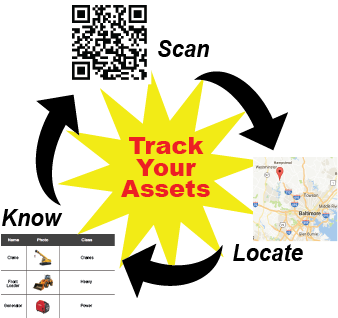 Solution: Once parts land at your facility for field distribution, immediately log them by attaching a QR label, scanning the item, and logging them into your portal at Runasset.com. Problem: Employers do not have controls in place to track regulatory-driven or company-driven compliance milestones for safety equipment. Equipment for use in fall protection, rigging, or gas monitors are not kept calibrated in accordance with these schedules.